School finance reform, teacher pay, and making our schools safer are among the governor's priorities this legislative session. Universal pre-K and addressing the increasing costs of teachers’ health care, as mentioned below, are massively important, too. 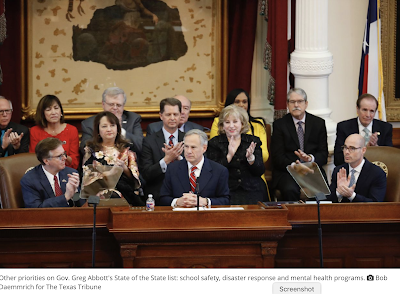 A report appearing today in the Austin American Statesman titled, "This time they mean it: Austin district trustees move closer to school closures," is deeply concerning locally that a respectable school finance bill could fix. The devil is always in the details. It's nevertheless encouraging to see that hot-button issues like "sanctuary cities" and "bathroom bills" are off the table. Abbott pledged, as he did in his inaugural address last month, that this is the year lawmakers will finally unknot the entangled policy issues of school finance and property tax reform. Last week, Abbott, Lt. Gov. Dan Patrick and House Speaker Dennis Bonnen, along with leaders on the issue from both chambers, laid outidentical property tax reform bills that they said would help lift the burden of skyrocketing property taxes.